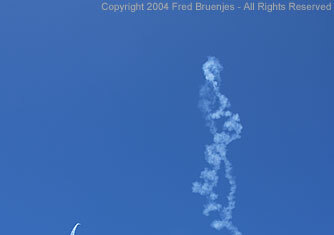 These photos were taken by me, Fred Bruenjes, at the 2004 NAS Point Mugu Air Show. 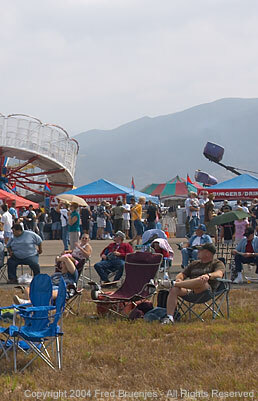 This was the 40th anniversary air show here at Pt. Mugu. 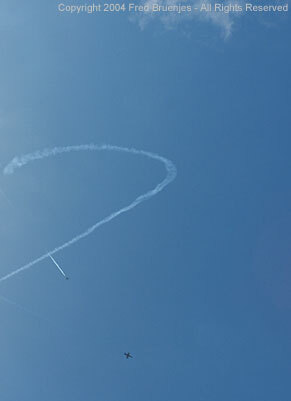 At some airshows the advertised show schedule seems more like a goal; here it was something you could set your watch to! I had a great time and will definitely be back next year. Click HERE to purchase prints of these photos, or click on any button. 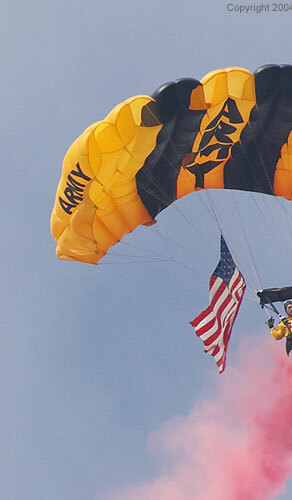 The U.S. Army Golden Knights Parachute Team jumped from 12,500 feet. "Tumbling Bear" Rob Harrison in the Zlin 50. Torrey Ward's R/C micro jet was FAST. 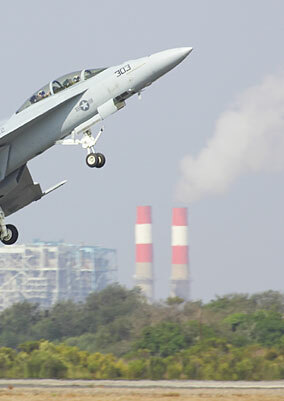 The F/A-18 Super Hornet put on a thundering performance. 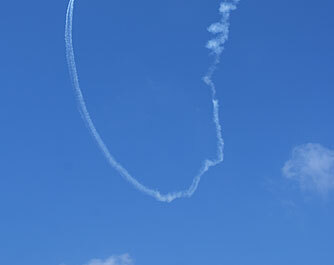 This vapor cloud does not mean he broke the sound barrier... but it means he did come really close! Say hello to Spanky and Grace. John Collver got right down to the ground in his T-6 Texan War Dog. 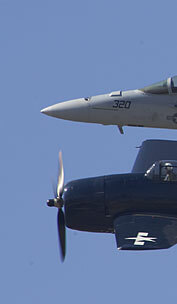 After lunch the E-2C Hawkeye 2000 performed. The large radome is a radar for tracking aircraft. 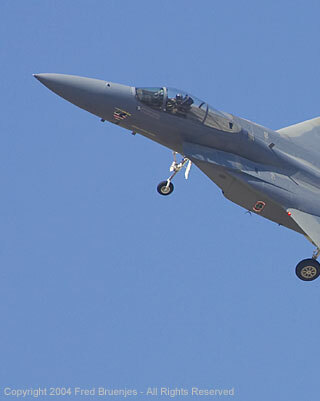 It is aircraft carrier based, so it can land and take off with a short runway. 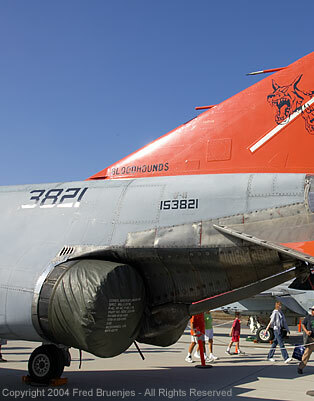 Its' wings fold for easier storage aboard a carrier. 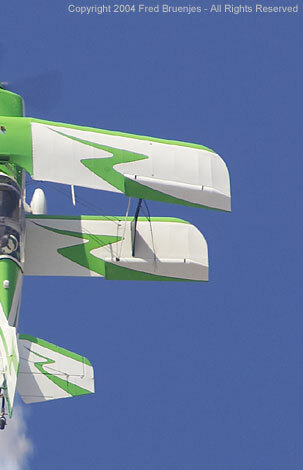 The Silver Wings Flight Team is wing walker Margaret Stivers and pilot Hartley Folstad. 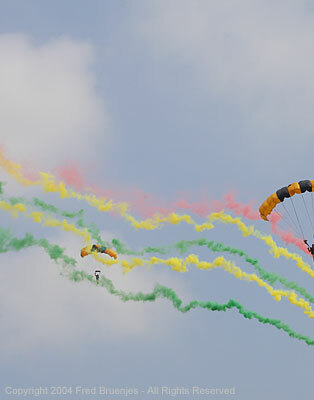 The Golden Knights jumped again in the afternoon. 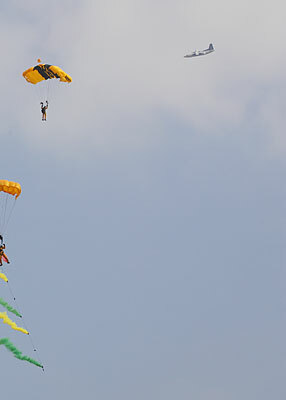 The recovery from a fouled parachute was demonstrated. A C-130J demonstrated handling abilities and performed a mock pallet drop. 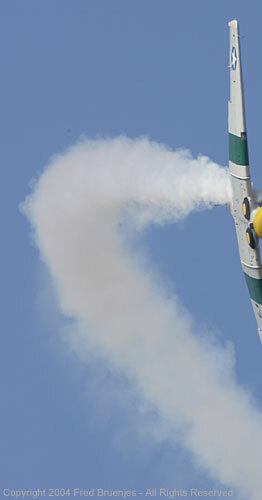 Bill Cornick spins upside down in his Pitts S-2C Big Bad Green. 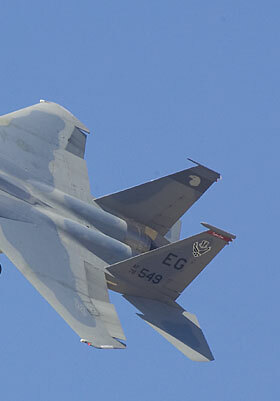 A second thundering performance was supplied by the F-15C Eagle. 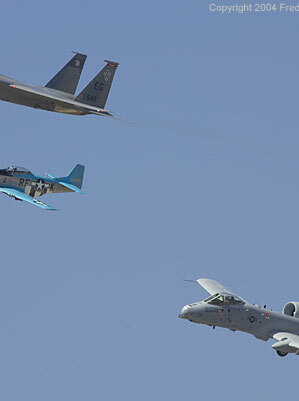 The Air Force F-15 Eagle, P-51 Mustang, and A-10 Thunderbolt did a heritage flight. 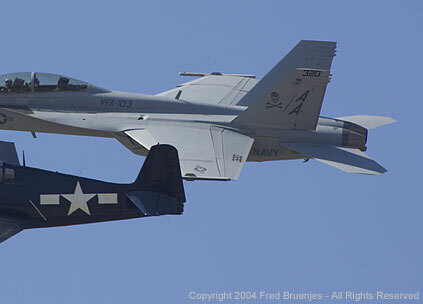 Not to be outdone, the Navy F-18 Super Hornet and F-6 Hellcat did a Tailhook legacy flight. 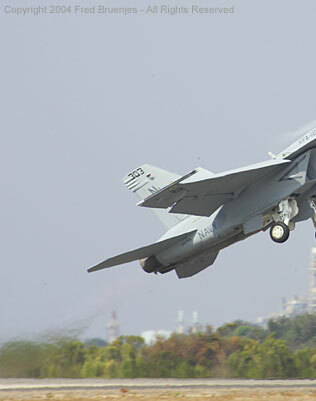 The F-18 came back for a sneak pass at very high speed! Pilots of the Patriots Jet Team rehearse before their performance. 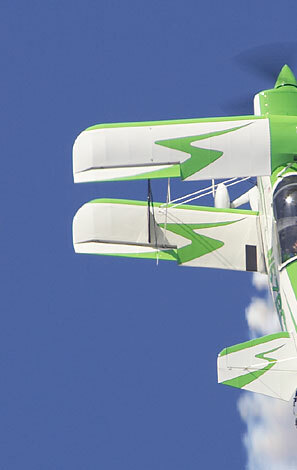 These L-39 Albatross jets are Czech built and specially modified for airshow use. They "wanted to express their love for us". 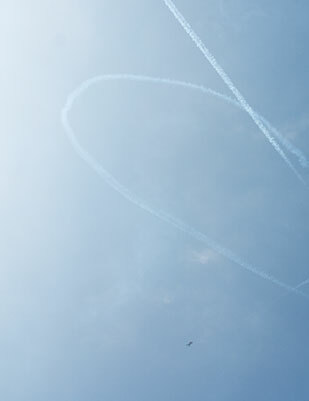 A trick normally performed only by the Blue Angels or Thunderbirds went off perfectly. 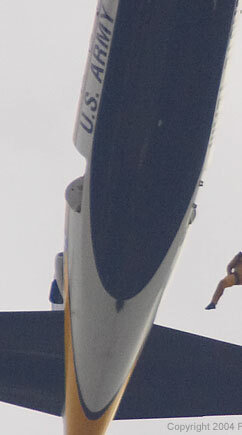 The Patriots are the only civilian jet performance team in the USA. 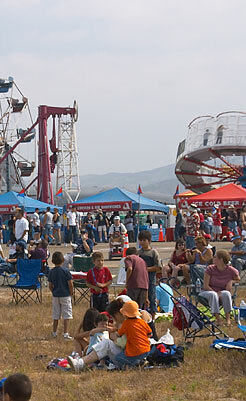 The show had plenty of activities for kids, including a full set of rides. The F-4 Phantom is becoming a rare sight nowadays. 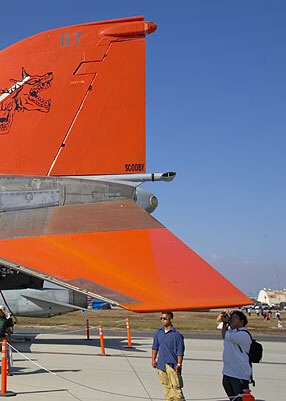 This is QF-4S Scooby. All text and images are © 2002-2006 Manfred Bruenjes - All Rights Reserved. 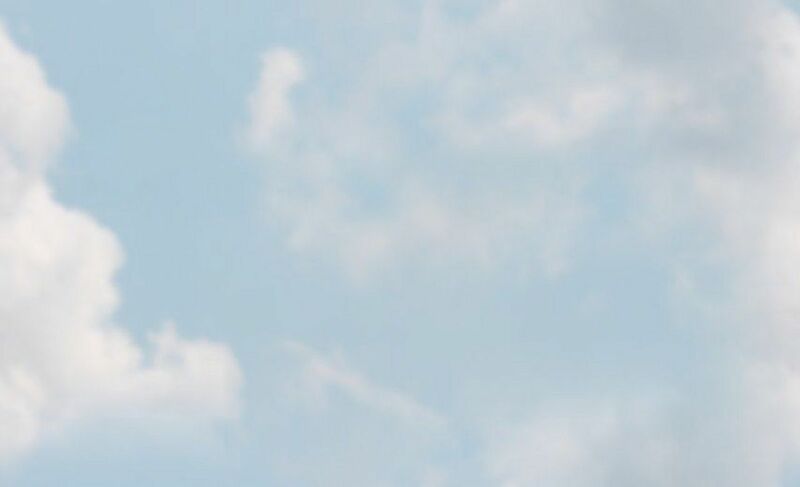 Image inlining (hotlinking) and/or framing are strictly prohibited. No reproduction, dissemination, repackaging, hosting, or other use of these images is allowed without written permission.